Before I get started please read and remember this: PLEASE GO TO THIS TACO TRUCK and GO OFTEN. The dead of winter is no time to decide to learn about local Taco Trucks. Many of trucks are on hiatus because it is too darn cold to cook and serve tacos when no one is even considering driving to a Taco Bell drive-thru because to weather outside is frightful. It is also not the best time to buy a Taco Truck and start a business. Lydia Labra and her husband Eladeo did just that in early February. The trailer they bought was at a familiar site near a car wash on Norton Road. I first met them on the day they were waiting for a new sign for their taco trailer so taco eaters would know there were new cooks in the kitchen. Their tacos are great, the Labras are even greater – these warm people made a cold day much warmer and brighter. February was a rough month – some days they only made $5 due to the weather and a less than ideal location. They decided to move the trailer to the higher traffic flow of West Broad Street but delays with permits and a run of bad luck delayed the move. They finally got the permit they needed on March 17th. While the waiting was going on, they maintained their optimism and kept cooking at home. Lydia called me with frequent updates on the progress of the permit situation because she knew I was anxious to tell their story and help others discover authentic food made by wonderful people. 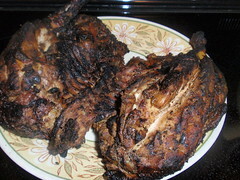 In this time of uncertainty, Eladeo made some of Los Potosinos’ trademark Pollo al Carbon, a perfectly grilled and marinated chicken. Lydia invited us to her home during a day of Taco Truck Field Research. Before we walked to their house I could smell the chicken roasting. When I saw 8 chickens ready and waiting for us – I was overwhelmed. They would not accept any payment for this pile of food that could feed a family of 10. The chicken tasted incredible. But the food was not on my mind in this moment (a first). This was easily the most moving act of generosity I have experienced in years and I did not feel worthy of the act. Am I biased about this truck? Absolutely. The food is good and this family deserves a shot at success. They will earn it. My dad was an immigrant once. He came to Columbus from one of the poorest areas of West Virginia. Eventually he bought a van and started his own business. He made a decent living based solely on word of mouth and the integrity that comes from hard work and honesty with his customers. Last year, after many years of scraping by and his own hardships my dad got a lucky break and moved to the West Virginia of Central America – Honduras. Now it is time for someone else with their own business based in a trailer/truck and a lot of hard work to get a lucky break. I hope the Labra’s are lucky. Their food speaks for itself and so does their customer service, but in this economy, being the best is not always enough. I also hope you are lucky enough to eat their food, it is worth the drive. 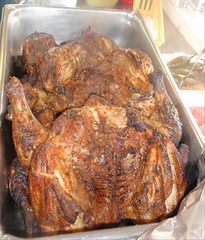 You can get the Pollo al Carbon on the weekends and maybe during the week if you call ahead. You can get tacos and a warm smile there everyday. Spring has sprung. 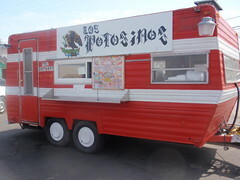 Los Potosinos is open for business everyday with an expanded menu. Breakfast and Elote (roasted corn on the cob) are now offered. 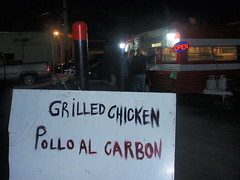 The Pollo al Carbon (weekends only) is available but call ahead with your order in case they run out. Expect homemade ice cream soon. Pollo al Carbon is served everyday and there is a new item – empanadas potosino! This entry was posted on March 19, 2009 at 2:56 AM	and is filed under culinary knowledge, sandwiches. 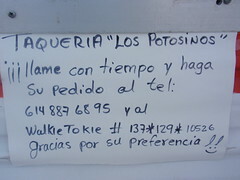 Tagged: Los Potosinos, taco trucks. You can follow any responses to this entry through the RSS 2.0 feed. You can leave a response, or trackback from your own site. I am excited to visit some taco trucks. For a newbie, can I ask two questions? I assume they are cash only? Do they offer vegetarian items? This touched my heart. Beautiful post. Hubby and I will make a trek out to this truck soon. Thank you. We just visited Los Potosinos last night, and oh, my lord, the chicken! Yum! We were on our second taco truck by then, so only had room for chicken tacos, but we’ll definitely be heading back to this truck another night for their chicken platter. Delicious.